Between 1915 and 1923, over one million Armenians died, victims of a genocidal campaign that is still denied by the Turkish government. Thousands of other Armenians suffered torture, brutality, deportation. Yet their story has received scant attention. 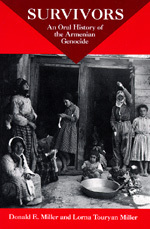 Through interviews with a hundred elderly Armenians, Donald and Lorna Miller give the "forgotten genocide" the hearing it deserves. Survivors raise important issues about genocide and about how people cope with traumatic experience. Much here is wrenchingly painful, yet it also speaks to the strength of the human spirit. Donald E. Miller is Professor of Religion at the University of Southern California and the author of Reinventing American Protestantism: Christianity in the New Millennium (California, 1997). Lorna Touryan Miller is Director of the Office for Creative Connections at All Saints Episcopal Church in Pasadena, California. Her parents survived the Armenian genocide.